I’ve known about this grunt thing for a while, but I had never gotten around to making one. I threaten it a lot, but it just wasn’t happening. So I finally did it, and there are no regrets here people, this is just good ‘ol home baking, in a simply fantastic way. You can make this with any fruit your heart desires. I happen to have leftover frozen berries from the winter, fresh nectarines, and a few first fresh strawberries of the season. For the next several months we will have an abundance of fresh fruits, so I would for sure use that, but as for winter I would use frozen. Originally the idea was brought to my attention for a camping dessert other than the s’mores. 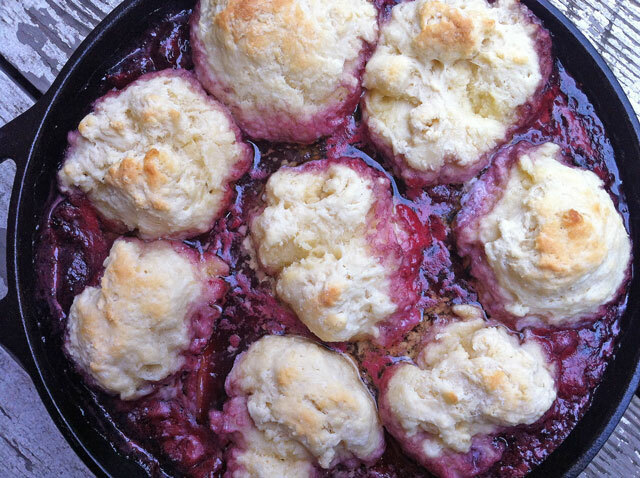 Which I love me some s’mores but there is nothing wrong with a cast iron berry biscuit dish. Which by the way that is what this is! Fruit and biscuits, need I say more? Nope, didn’t think so. Raspberries, blueberries, blackberries, strawberries, peaches, nectarines, rhubarb, anything goes. There seems to be a lot of instructions here, I wanted to be thorough, but really this is a very simple dish you should totally make right now. Adapted from Alton Brown’s Blackberry Grunt Recipe. 1. Place the flour, baking soda, baking powder, and salt in a bowl, use a whisk to mix it up well. Put the cut up pieces of butter in the bowl and use you fingers to break it up into little chunks, almost to pea size. It is ok if there are little chunks here and there, no need to be perfect here at all. You can also use a pastry cutter to incorporate the butter. I always use my hands for this kinda stuff. 2. Once the butter is incorporated, make a well in the middle of the flour and add the buttermilk. Bring them together using your hands or spatula, mix until the flour is wet, but do not over mix. Chunks and layers of flour is good here, that is what makes a biscuit a biscuit. If you have any tip and trick questions, just ask! Form a ball of dough, cover and place in the fridge. 3. 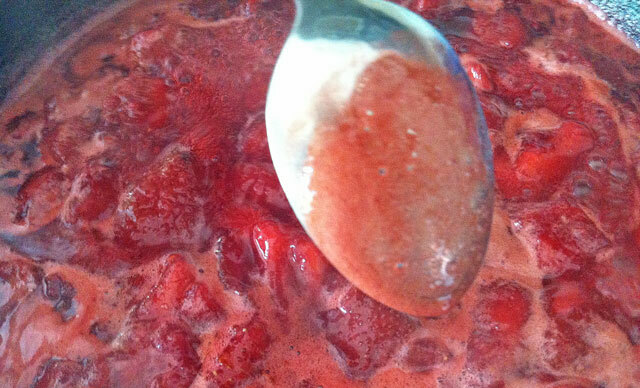 In a separate bowl add the berries, sugar, orange juice, and orange zest, pinch of salt, about 1/8 tsp, mix well. Grab a 10 inch cast iron skillet, wipe off any excess oil you see from previous seasonings. Place over medium heat. Melt 1 tsp of butter to coat the bottom and sides of the cast iron. 4. 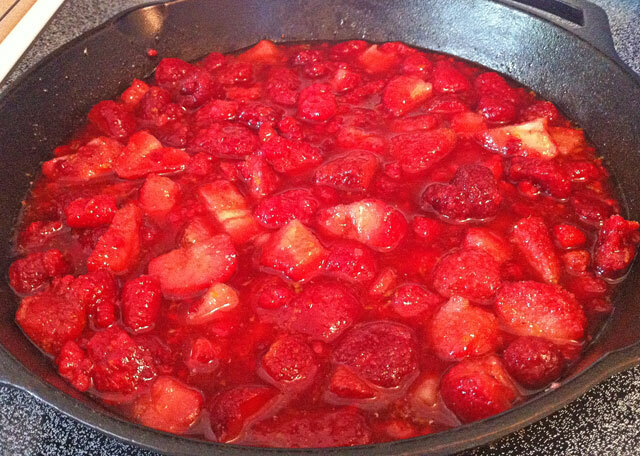 Place the berry mix in the cast iron, and cook over medium low heat for 20-25 minutes or until it thickens. While the berries cook, cut up your nectarine if using. Tip: There is a spoon trick called “nappe” which means coating the back of the spoon. Dip the spoon into the sauce, when the liquid coats the back of the spoon evenly, that is nappe, and it is ready to go. This is “nappe”, and after cooking for 20 minutes. 5. Add the nectarines on top, no need to mix them in. Take the dough out of the fridge, use your hands and grab a bit of dough place on top the, free form, no perfect balls. Place the pan in the oven for 20 minutes or until the tops of the biscuits are lightly golden. 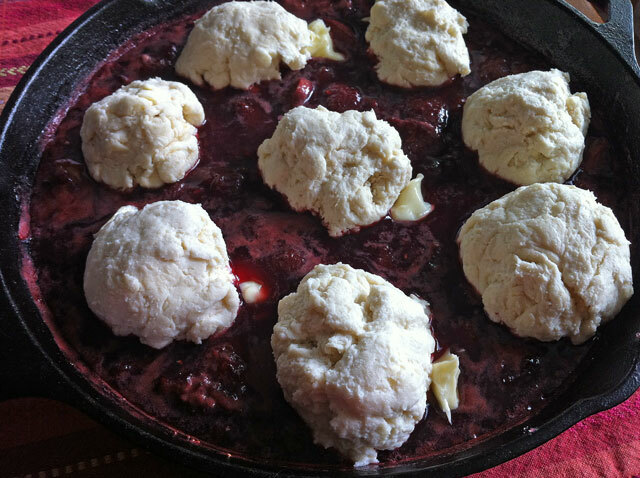 Note: If you’re taking this camping, just cook the berry mix the same until nappe, then add the biscuits and cook for an additional 30 minutes, or until you see the biscuits are lightly golden brown. You can do this on your grill, stove, or right over the fire. Take a handy glove to get the cast iron off the heat. Berry desserts are one of the highlights of summer! Totally a great idea, and how about some plum jam too!